Just back from two days in San Francisco for Web 2.0. Plenty has been written about it here, here, here and here (oh and here too) so I thought I'd share a little Web 2.0 0.5. For your purchase consideration...the ultimate Web 0.5 appliance. "The computerless (is that even a word?) 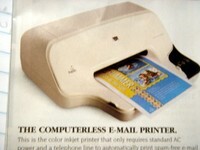 e-mail printer." Available at Skymall, this handy-dandy money-sucking device will automatically dial into a server, download and print all your email. It cuts out the middle-man...the computer. Worried about spam getting automatically printed at home? Don't worry! (The ad promises...) Your email address will not be shared with any advertisers or junk-mail list. ha-ha! Yahoo!, AOL, MSN and Gmail don't share their email lists either but that doesn't stop spammers from finding you! WTF!? Then again...the target audience wouldn't understand this. Oh yeah... and it's $9.99 per month for the email service + $149.99 for this "door-stop." Endless supply of ink cartridges sold separately to keep up with the 100 vi@gRa and 'Refinance Now' email offers you get every day.